Medical Syringes Sizes to Choose From! 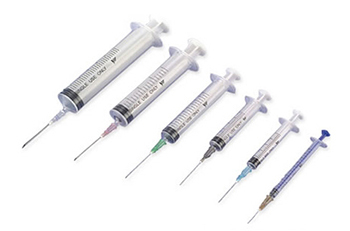 Syringes come in a wide range of sizes, shapes, and measurements. It all depends on the dimensions. To use one, you have to either be experienced or simply follow the directions. Your doctor is an excellent source of information, but you can find out more from websites dedicated to the subject. Syringe sizes are important to people who use it to inject fluid into their bodies. Some of these individuals include diabetics or those show suffer from serious allergies. While syringes are typically used to inject medications, they can also be used to remove fluids from the body. Doctors often use these tools to draw blood for further evaluation, using syringes in various sizes depending on the patient’s needs. The syringe sizes are based on the amount of fluid the barrel can hold. The fluid, medicine or liquid is stored in the barrel until the injection is administered. The volume measurement of the liquid is typically in milliliters. This allows for a more precise measurement. In most cases, the barrel ranges in size from 0.5 to 50 ml. Syringes and needles used to administer insulin are also made in different sizes. The insulin dosage determines which of the syringe sizes individuals need to administer the medicine. For example, if you want to inject 30 units, you would use three 10 cc units, which amounts to a total of 30 units. If you are injecting 31 to 50 units, you would use the 0.5 cc syringe for administering 50 units. If the dose is 51 units, you would use a 1 cc syringe, which administers 100 units. The size of the needle also varies by individual syringe size. We carry a variety of syringe sizes at low bulk pricing, giving you access to the tools you need to stay healthy. It is ideal to buy in bulk because most of these syringes are disposable and cannot be reused due to health reasons and hygiene. Always store your needles and syringes in an approved sharps container for proper disposal. Apart from understanding that medical syringes come in a variety of dimensions, it is also essential to learn about their parts. The typical syringe consists of several parts: the plunger, barrel, hub, needle and protective cap. You will find the plunger in the lower region of the syringe. It is manufactured using plastic or glass. The plunger fits inside the barrel and moves up and down to fill or empty the barrel. The hub holds the needle adapter and keeps the needle intact. For safety, it locks the needle in place while the syringe is used. The needle also has comes in different sizes, depending on its use. Finally, the protective cap keeps the needle free of contamination. If you want to know which of our syringe sizes is right for you, browse our variety of syringe options. When you’re purchasing a medical syringe, there are a few things to keep in mind. Medical syringes are important tools, but have a variety of options that can make purchasing decisions difficult. Sizing: Numbers associated with medical syringes are associated with the amount of liquid that can be held in the barrel of each syringe. These are typically measured in milliliters, but can also be labeled with cc, which stands for cubic centimeters. One cubic centimeter is the equivalent of one milliliter. It’s important for professionals to know the end use of the syringe. Someone with diabetes, for example, who knows how many units of insulin are needed with each injection, can purchase diabetic syringes based upon the dosage size. Likewise, a doctor extracting fluid can choose an appropriately sized syringe based upon the amount of liquid to be removed. Dead space: There are two different types of syringes: low dead space and high dead space. The dead space is the area between the syringe hub and the needle, where liquid is more difficult to extract and typically remains trapped in the syringe. Not only can a high dead space syringe leave wasted medication, but they can also cause an incorrect dosage to be administered, and affect the patient’s health. Try to find a low dead space medical syringe, which will save you money and provide better overall care for your patients.